If I could describe my psoriasis with a movie title, I would call it “Les Misérables” which translates into “the miserable ones.” Although the movie title is actually a film and book related to the 1800s, when applied to my life the title describes how frustrating it is to have an unpredictable inflammatory disease like psoriasis. Despite the fact I have had psoriasis for two decades, I never get used to the difficulties of finding an effective yet safe treatment. In the last couple of years, I have seen a lot of talk in the psoriasis community about the magic of Turmeric for psoriasis. The burnt orange powder we typically see as turmeric comes from a plant in the ginger family, which grows in parts of Asia and Central America. While turmeric is a great spice commonly found in Indian cuisine, it has also been deemed as a “miracle” supplement for health to help improve brain function, heart disease, cancer, Alzheimer’s, and inflammatory disease like psoriatic disease. The creators of Prosoria™, a 3-step daily psoriasis treatment system that received the National Psoriasis Foundation (NPF) seal of recognition, have a new holistic treatment option for individuals living with psoriatic arthritis. It is the Nuvothera Super-Micronized™ Turmeric Curcumin and it is a natural approach for treating psoriatic disease from the inside out. Like many chronic illnesses, an overactive immune system is the reason for psoriatic disease (PsA), which causes inflammation in the body. In the case of a person living with PsA, this inflammation occurs within the skin and joints. Research reveals a “faulty” signal in the body alters the signaling pathways of the immune system, which results in an increased level of inflammation. Evidence supports curcuminoids (aka curcumin); the active ingredient found in turmeric can possibly help to reduce inflammation and the progression of chronic illness by minimizing overactive inflammatory pathways. How is the Super-Micronized™ Turmeric Curcumin different from other brands? The Super-Micronized™ Turmeric Curcumin is different from most brands in several ways; most turmeric supplements simply pass through the body but are not absorbed. However, the Super-Micronized™ Turmeric Curcumin has maximized absorption qualities. Nuvothera turmeric goes through a micronization process, which reduces the average diameter of the solid material particles, making the turmeric more potent by reducing the size so small that it is actually efficiently absorbed by the body. 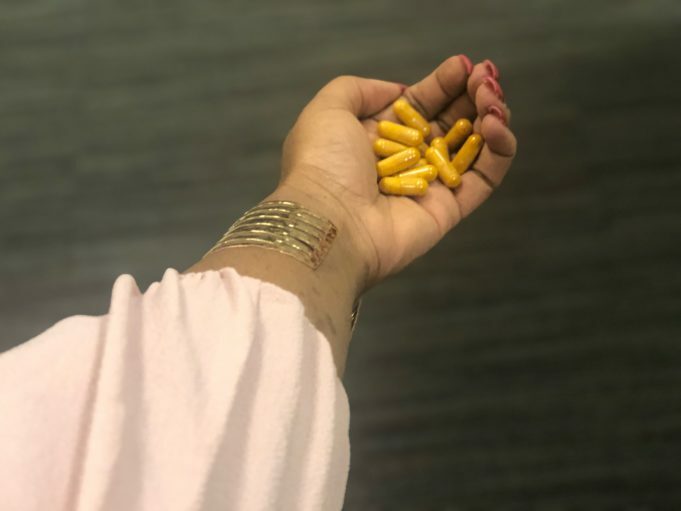 Other companies use chemical absorption enhancers, which can negatively affect individuals, an ingredient Nuvothera states it does not need “We discovered how to unlock the full potential of Turmeric and Curcumin to create potent therapeutic results. The difference between our Turmeric supplement and others is our Super-Micronized™ formulation and the use of 100% natural whole turmeric root instead of 95% purified Curcumin. Working with leading scientists we engineered a way to use micro particle technology to greatly enhance the absorption of turmeric for maximizing turmeric’s effectiveness,” shares Art. The troubling part about holistic OTC options for conditions is there are not many studies for them. However, there are more than 6000 published studies on Turmeric which highlight it’s positive effects on health. I have met many people living with psoriatic disease who swear by the positive effects of turmeric. Stay tuned for my unboxing video as I put this brand to the test on the impact it has on my body. This is a sponsored blog post, but all opinions are my own. I only feature products I use and truly believe in.